1. Answer A is correct. Stadol reduces the perception of pain, which allows the post-operative client to rest. Answers B and C are not affected by the medication; therefore, they are incorrect. Relief of pain generally results in less nausea, but it is not the intended effect of the medication; therefore, answer D is incorrect. 2. Answer B is correct. Children with cystic fibrosis are susceptible to chronic sinusitis and nasal polyps, which might require surgical removal. Answer A is incorrect because it is a congenital condition in which there is a bony obstruction between the nares and the pharynx. Answers C and D are not specific to the child with cystic fibrosis; therefore, they are incorrect. 3. Answer D is correct. Lipid-lowering agents are contraindicated in the client with active liver disease. Answers A, B, and C are incorrect because they are not contraindicated in the client with active liver disease. 4. Answer C is correct. Oatmeal is low in sodium and high in fiber. Limiting sodium intake and increasing fiber helps to lower cholesterol levels, which reduce blood pressure. Answer A is incorrect because cornflakes and whole milk are higher in sodium and are poor sources of fiber. Answers B and D are incorrect because they contain animal proteins that are high in both cholesterol and sodium. 5. Answer A is correct. The child will need to avoid straddle toys, swimming, and rough play until allowed by the surgeon. Answers B, C, and D do not relate to the post-operative care of the child with hypospadias; therefore, they are incorrect. 6. Answer A is correct. Eating a carbohydrate source such as dry crackers or toast before arising helps alleviate symptoms of morning sickness. Answer B is incorrect because the additional fat might increase the client’s nausea. Answer C is incorrect because the client does not need to skip meals. Answer D is the treatment of hypoglycemia, not morning sickness; therefore, it is incorrect. 7. Answer A is correct. The stethoscope should be left in the client’s room for future use. 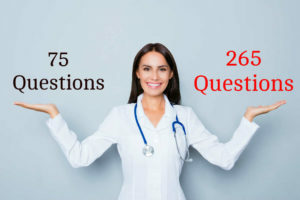 The stethoscope should not be returned to the exam room or the nurse’s station; therefore, answers B and D are incorrect. The stethoscope should not be used to assess other clients; therefore, answer C is incorrect. 8. Answer B is correct. The medication will be needed throughout the child’s lifetime. Answers A, C, and D contain inaccurate statements; therefore, they are incorrect. 9. Answer B is correct. Glucotrol XL is given once a day with breakfast. Answer A is incorrect because the client would develop hypoglycemia while sleeping. Answers C and D are incorrect because the client would develop hypoglycemia later in the day or evening. 10. Answer D is correct. The client with myasthenia develops progressive weakness that worsens during the day. Answer A is incorrect because it refers to symptoms of multiple sclerosis. Answer B is incorrect because it refers to symptoms of Guillain Barre syndrome. Answer C is incorrect because it refers to Parkinson’s disease. 11. Answer B is correct. To prevent fractures, the parents should lift the baby by the buttocks rather than the ankles when diapering. Answer A is incorrect because children with osteogenesis imperfecta have normal calcium and phosphorus levels. Answer C is incorrect because the condition is not temporary. Answer D is incorrect because the teeth and the sclera are also affected. 12. Answer A is correct. Placing the client on strict NPO status will stop the inflammatory process by reducing the secretion of pancreatic enzymes. The use of low, intermittent suction prevents release of secretion in the duodenum. Answer B is incorrect because the client requires exogenous insulin. Answer C is incorrect because it does not prevent the secretion of gastric acid. Answer D is incorrect because it does not eliminate the need for analgesia. 13. Answer B is correct. A rigid or boardlike abdomen is suggestive of peritonitis, which is a complication of diverticulitis. Answers A, C, and D are common findings in diverticulitis; therefore, they are incorrect. 14. Answer A is correct. Protigmine is used to treat clients with myasthenia gravis. Answer B is incorrect because it is used to reverse the effects of neostigmine. Answer C is incorrect because the drug is unrelated to the treatment of myasthenia gravis. Answer D is incorrect because it is the test for myasthenia gravis. 15. Answer D is correct. The suggested diet for the client with AIDS is one that is high calorie, high protein, and low fat. Clients with AIDS have a reduced tolerance to fat because of the disease as well as side effects from some antiviral medications; therefore, answers A and C are incorrect. Answer B is incorrect because the client needs a high-protein diet. 16. Answer B is correct. The nurse can help ready the child with cerebral palsy for speech therapy by providing activities that help the child develop tongue control. Most children with cerebral palsy have visual and auditory difficulties that require glasses or hearing devices rather than rehabilitative training; therefore, answers A and C are incorrect. Answer D is incorrect because video games are not appropriate for the age or developmental level of the child with cerebral palsy. 17. Answer C is correct. Most infants begin nocturnal sleep lasting 9–11 hours by 3–4 months of age. Answers A and B are incorrect because the infant is still waking for nighttime feedings. Answer D is incorrect because it does not answer the question. 18. Answer A is correct. The child with myelomenigocele is at greatest risk for the development of latex allergy because of repeated exposure to latex products during surgery and from numerous urinary catheterizations. Answers B, C, and D are much less likely to be exposed to latex; therefore, they are incorrect. 19. Answer D is correct. The nurse or parent should use a cupped hand when performing chest percussion. Answer A is incorrect because the hand should be cupped. Answer B is incorrect because the child’s position should be changed every 5–10 minutes and the whole session should be limited to 20 minutes. Answer D is incorrect because chest percussion should be done before meals. 20. Answer A is correct. No more than 1mL should be given in the vastus lateralis of the infant. Answers B, C, and D are incorrect because the dorsogluteal and ventrogluteal muscles are not used for injections in the infant. 21. Answer C is correct. Depot injections of Haldol are administered every 4 weeks. Answers A and B are incorrect because the medication is still in the client’s system. Answer D is incorrect because the medication has been eliminated from the client’s system, which allows the symptoms of schizophrenia to return. 22. Answer D is correct. Tucking a disposable diaper at the perineal opening will help prevent soiling of the cast by urine and stool. Answer A is incorrect because the head of the bed should be elevated. Answer B is incorrect because the child can place the crayons beneath the cast, causing pressure areas to develop. Answer C is incorrect because the child does not need high-calorie foods that would cause weight gain while she is immobilized by the cast. 23. Answer B is correct. Coolness and discoloration of the reimplanted digits indicates compromised circulation, which should be reported immediately to the physician. The temperature should be monitored, but the client would receive antibiotics to prevent infection; therefore, answer A is incorrect. Answers C and D are expected following amputation and reimplantation; therefore, they are incorrect. 24. Answer A is correct. Following extracorporeal lithotripsy, the urine will appear cherry red in color but will gradually change to clear urine. Answer B is incorrect because the urine will be red, not orange. Answer C is incorrect because the urine will be not be dark red or cloudy in appearance. Answer D is incorrect because it describes the urinary output of the client with acute glomerulonephritis. 25. Answer B is correct. An adverse reaction to Cognex is drug-induced hepatitis. The nurse should monitor the client for signs of jaundice. Answers A, C, and D are incorrect because they are not associated with the use of Cognex.